Alessi is one of those companies which embodies a typical phenomenon of Italian industrial culture, namely that of “Italian Design Factories”. Since time immemorial, my family has been firmly estabilished on Lake Orta. In this poor, narrow valley in the Italian Alps, close to Switzerland, a long-standing tradition in wood and metal handicraft has survived up to this day. 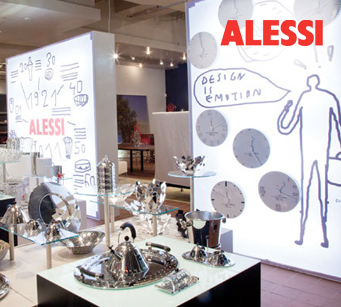 Alessi products are still considered as being handicraft items made with the aid of machines. Research Lab in the Applied Arts, the role of which is to mediate continually between the most advanced and stimulating expressions of international creative culture on the one hand, and the public's requirements and dreams on the other. A lab that should be as open and dedicated to the world of Creation as possible. The right type of contribution that an industry such as Alessi can make to the civilised development of the consumer society is to be an artistic mediator, attempting to create new objects, introducing a touch of transcendency, helping us decipher our own modernity.